The F-35, the much-maligned fighter jet in development for the past 15 years, is finally combat ready, the Air Force has announced. A version of the F-35 Joint Strike Fighter—the F-35A Lightning—has reached the Air Force’s initial operating capability (IOC). The term is often used by the U.S. government or military to describe a state achieved when a capability is available at its minimum deployable form. The entire program cost $379 billion, and is the Pentagon’s largest weapons project. “The U.S. Air Force decision to make the 15 F-35As at Hill Air Force Base combat ready sends a simple and powerful message to America’s friends and foes alike—the F-35 can do its mission,” F-35 Program Executive Officer Air Force Lt. Gen. Chris Bogdan said in a statement. Were the F-35 Plans Intentionally Leaked to the Chinese so They Could Build J-31 Fighter? In a briefing with reporters on Tuesday, Carlisle said the F-35A still needs work, but there have been significant improvements to the aircraft from its early days of development. He said the F-35A’s electronic warfare, stealth, and sensors are needed more than ever. Officials have said the plane will give American forces the ability to detect adversarial aircraft and other threats beyond the current means. The Air Force plans on buying 1,763 F-35As in the coming years. 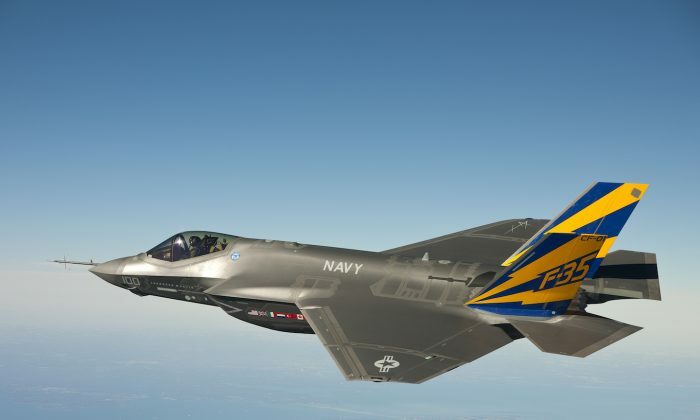 Sen. John McCain, Chairman of the Senate Armed Services Committee, noted the F-35A’s bumpy progress, describing the current stage as an “important milestone” in the history of the program, launched in 2001. The next steps, he added, are crucial in determining if the F-35A can replace or supplement the current crop of U.S. military fighter planes.